JAKARTA: Mount Agung erupted again at 11:49 a.m. on Tuesday, spewing a plum of ash 1.5 kilometers into the air, according to the Indonesian National Board for Disaster Management. The status of the volcanic eruptions is still in Level III (Standby) after it was lowered from Level IV (Hazardous) last Saturday. Local authorities ordered the public not to carry out any activity within a 4km radius of the crater. 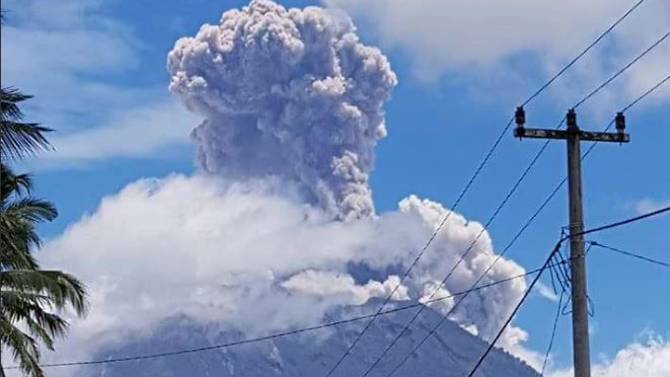 ChannelNews Asia reported that it was business as usual at the I Gusti Ngurah Rai International Airport in Bali, which was shuttered for at least three consecutive days in November due to high activity from the volcano. “The airport’s operations continue to run as normal and no effects have been seen,” Airport spokesperson Arie Ahsanurrohim said. The intensity of the ash was assessed as medium, but no further eruptions followed. Light ash fell in Pandan Sari, Dukuh village, Kubu subdistrict in Karangasem.